What an amazing GEM. Not only do we consider it high end, we even tried it for a +. We have no idea what is behind PCGS logic here (and we make no promises it will +). Outrageous full booming mirrors can be seen far away. The mirrors do have great clarity and are clean. When you twirl the coin all you see is the flash of the mirrors and extremely enhanced colors. Both sides enjoy a totally original mix of navy/magenta/rose/purple/deep green colors. The colors are moderate to deep but they are far from dull or crusty. Every detail is sharply struck. You don’t see commoner dates looking this spectacular! Estimated 460 minted. PCGS 8, NGC 2, CAC 6. 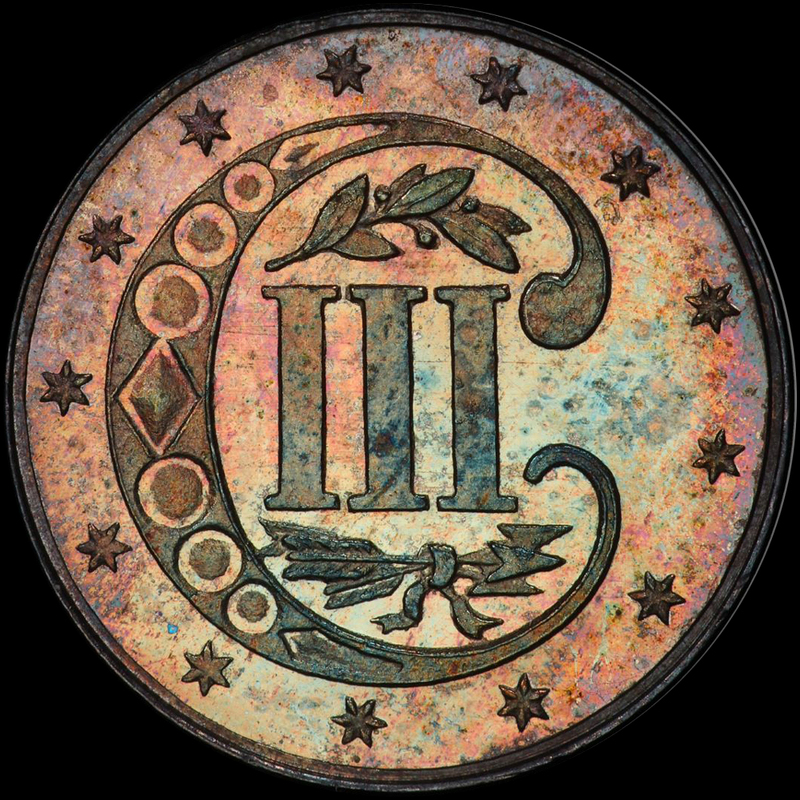 PCGS has graded only 4 coins higher. This is NOT a common date by any stretch. We paid $9,988.00 09/2018 for this coin out of our auction. How could we not? Bidding was soft and we LOVE GEM PR 3CS (we have assembled the #1 and 2 sets). Pricing/values are all wrong for this date in PR65 and higher. 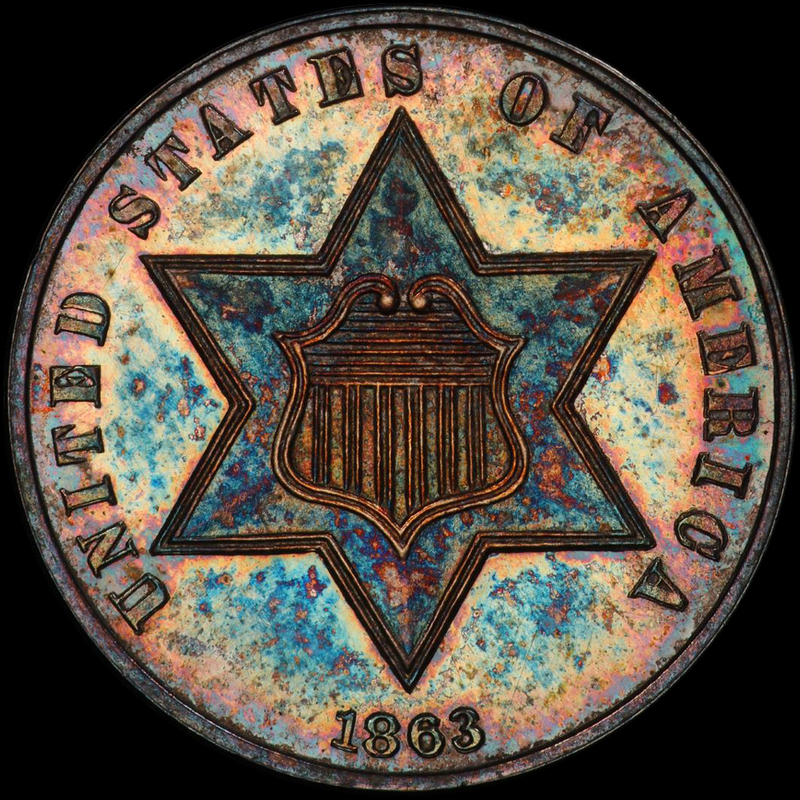 Opportunity knocks so loud here if you love PR 3CS or love gorgeous obsolete, GEM , and original toned coins.